It’s safe to say that Amsterdam will be busy this summer, with 350 festivals and large events. Despite this, there’s always room for more. At least, that’s what the people behind the Amsterdam Woods Festival thought. An new and intimate, smaller festival for people of all ages with a passion for music. Just like Into The Great Wide Open on the West Frisian Islands. 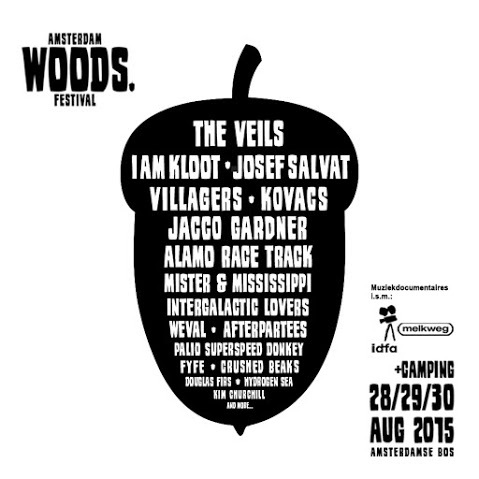 Jacco Gardner, The Veils, I Am Kloot, Josef Salvat and Alamo Race Track are just a few of the names on the bill. But there’s more to see than just artists; IDFA and the Melkweg have a few music documentaries for you to enjoy: Wolflady, Austin to Boston, Montage of Heck (Kurt Cobain!) and Fink meets Royal Concertgebouw Orchestra. Due to overwhelming success and prosperous ticket sales the organization decided to program a third stage for upcoming artists, together with the national talent competition De Grote Prijs van Nederland. To top it of there’s a food area, with food trucks, wine bars and beer breweries. All in all a diverse music-packed program, especially if you’re into something other than dance for a change.